Tycoon celebrates its 30th anniversary with these Signature congas and bongos, the most impressive from this green-aware company yet, plus the attractive mid-priced Select series and a pair of killer djembes. Great build quality, playability and value for money. Beware the metal rims and tensioners! This year sees the 30th anniversary of Tycoon percussion. Previous to 1983, the family-owned company supplied percussion instruments to many outside companies, all made in its own dedicated factory in Bangkok, Thailand. This month we have a pair of djembes alongside both mid-priced and professional congas and bongos to wallop. In manufacturing congas and bongos Tycoon uses only certified, plantation-farmed Siam oak from carefully managed sources which are renewed every five to seven years. All the conga and bongo shells are made using solid barrel staves of Siam oak. Let's start with the pair of Supremo Select series congas with their striking 'chiselled orange' finish. If you find that a bit radical you can opt for the super-high gloss finish. 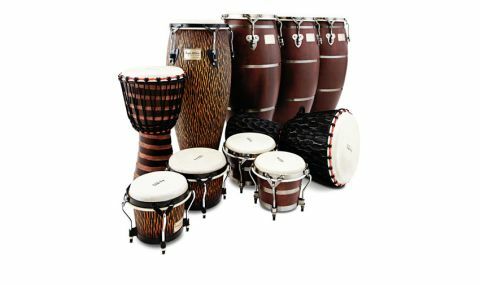 The 10" quinto and 11" conga are 28" high and a 12" tumba is also available separately. Hardware is black powder-coated and includes Classic Pro steel hoops and individual cradle stands. Heads are water buffalo skin. "You'll pay almost three times more for the Signature Heritage congas, but you can see where the money goes"
You'll pay almost three times more for the Signature Heritage congas, but you can see where the money goes. Here's a magnificent trio - an 11" quinto, 113⁄4" conga and 121⁄2" tumba - the most impressive congas yet from Tycoon. This time they are 30" high and barrelled out substantially for a fat belly look, finished in a gorgeously rich chestnut brown matte stain. The chunky hardware is in brushed chrome including Classic Pro hoops and three steel reinforcing bands, while the three-point mount tension plates and 3/8" bolts add to the rugged image. There are also matching die-cast handles with supremely comfortable finger grips, most welcome since the drums are seriously heavy. Topping it off are the creamy calfskin heads. Complementing the congas are the Signature and Supremo Select series bongos, also made from aged Siam oak. Both pairs consist of 7" macho and 81⁄2" hembra, with finishes to match their big brother congas. The two African djembes are carved from single solid lumps of sun-dried mango - a relatively soft wood so they are quite light. This is especially so given that there is no metal hardware. Instead they employ 5mm non-stretch rope for the traditional tensioning system and carrying handles. The 10" has a 'T2' gouged-out ringed finish, while the 12" has large chiselled carvings and a natural varnish finish. Tycoon offers an appropriate sling stand if you should require it. The mid-budget Supremo Select series congas and bongos deliver reliably authentic sounds. They are, though, thinner and more shrill compared with the richer, fatter tones of the Signature drums. With its smoother, creamier texture the calfskin does feel luxurious compared with the coarser water buffalo. "Slap strokes have a sweet purity, deep open tones are fresh and rounded"
Slap strokes have a sweet purity, deep open tones are fresh and rounded, while heel-tip patterns have a crisp pitter-patter. There is a long sustain with a pitch bend which testifies to the exaggerated barrel shape. You have to work for the sounds and thick heads do need playing in, but the quality is unmistakable. This is true with the Signature bongos also, which have an equally smooth feel and tone. The bullet-proof construction makes these bongos a little heavy for comfortable traditional playing between the knees, and you might be grateful for the heavyweight chrome-plated stand which you can buy as an option. One word of caution. Although the bearing edges of all these drums are typically raised, they are only just high enough to make playing comfortable without damaging the heel of your hands by catching them on the metal rims and tensioners. Tuning is easily accomplished using the supplied spanners with extra hefty 3/8" tuning bolts for the Signature Heritage congas and 5/16" bolts for all the other congas and bongos. The two djembes are light and easy to handle and with their traditionally mounted and stretched heads yielding piercing, colourful tones. Pulling a sound from a djembe is always easier than from congas or even bongos and these are rewarding, fun instruments to play for any musician, amateur or pro. The two work perfectly as a pair, the 10" has a decent bottom and a great pinging slap and the 12" is a monster with volume and projection to spare.